We were looking for a very special and different wedding venue and Carole certainly delivered this for us. From the first communication right through to the day itself we were given an excellent and friendly, personal service and a memorable and romantic wedding setting. 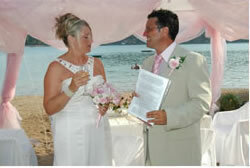 One of the initial reasons for us deciding to book with Carole and Tafun was that their wedding package offered a complete service including dealing with all legal matters. 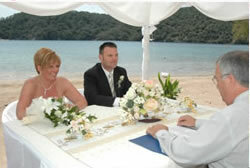 These formalities were dealt with effectively and without any hidden cost. We were also attracted by the flexibility of the package enabling us to add or change elements to meet our particular requirements. Carole was very helpful in this regard and were more than happy to give what time they could in looking to meet these wishes. One of the best things we found was being able to deal directly with both Carole and Tafun who were only ever a phone call away and thereby giving us a very personal service. For those of you who are not familiar with Turkey, the Bay of Fethye is simply stunning and provided a wonderful setting for our Sunset Wedding. On the Big Day, the Carole Ann and her crew played their part making sure all our guests felt welcome and well looked after and the food, music and service was first rate. The wedding was absolutely everything we had hoped for! Just a quick note to say a very big thank you for helping us with our wedding plans. Tom and I and all of our friends had a wonderful time and the whole thing from start to finish was absolutely stress free for us which was just what we wanted. We were really impressed with your reliability,something which is really important when your trying to sort something out in another country-all of our e-mails and questions were answered promptly and nothing was too much trouble. The venue was perfect and tables/ decorations were simple and informal just as we wanted.The microlight confetti drop was a great touch and the belly dancer was superb and certainly took the men’s minds off the Rugby World Cup final. Finally and probably most importantly we thought the cost was extremely reasonable and we really felt we had great value for money-in fact we wonder how you manage to make any profit given the quality of everything from flowers,photographers and venue ! Also worth a very big mention is the hairdresser you recommended Sharon,she was fantastic and incredibly patient with us all ! Again a big thank you,we’ll certainly recommend you to any of our friends visiting the area requiring help with anything,all the best with your business in the future and if you need anyone to speak with English couples wanting to plan a wedding through yourselves we would be more than happy to do so. and taken care of making the day totally stress free. On behalf of the new Mr & Mrs Poscha, my husband Tony and myself, I would like to thank you very, very much for all of your organisation and hard work on our behalf. Tony and Sam’s wedding could not have been bettered, our guests loved it and we were absolutely thrilled with everything. Everyone said they would not have changed a thing so thank you once again, we would not hesitate to recommend you. Dear Carole (and everyone else who helped)! Just a quick note to say many thanks for our perfect wedding day! Everything went so smoothly, with no stress and everybody enjoyed themselves. The day with Tay fun (in Antalya) was great, ceremony perfect and food delicious. 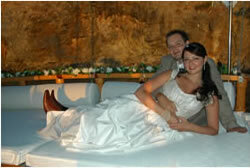 We would recommend you to anyone that wants to get married. 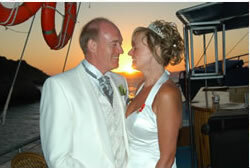 Our Yacht wedding with Carole was the best day of our lives and could not have been anymore perfect. It was fantastic to have no stress, organising or running around on the lead up to our big day as everything was done for us! The boat was definitely the perfect choice for our wedding and the scenery was breath taking. All of our guests have said it was the best wedding they have been to because it was so informal, so relaxed and so much fun. They also loved being able to have a swim in the sea after the ceremony! Carol organised everything perfectly and we had everything we wanted – even managing to decorate the whole boat in lilac flowers to match the colour of my bridesmaid dresses! Thank you so much to both of you and the crew for all of your hard work and for giving us a perfect wedding. We hope to return next year for our first anniversary and join you on your sunset cruise. Just again wanted to say Thank you so much for a lovely wedding. 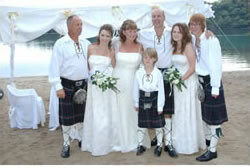 We could not of wished for anything nicer- we loved every minute and I think so did our guests. Everything was great- decorations, food, music etc.